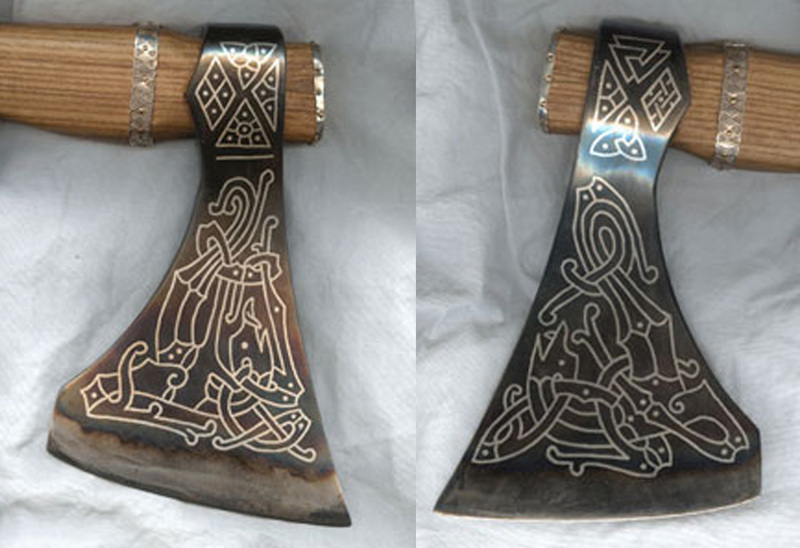 This elaborate bearded ax is large, over a meter and a quarter end to end, but remarkably well balanced, a treasure for the serious collector. It is ornamented with silver inlay work, haft decorations, and a carved grip area. One of the interesting projects I have been asked to do recently was to make a brow band for a combat helmet with silver inlay, and engraved panels front and back. 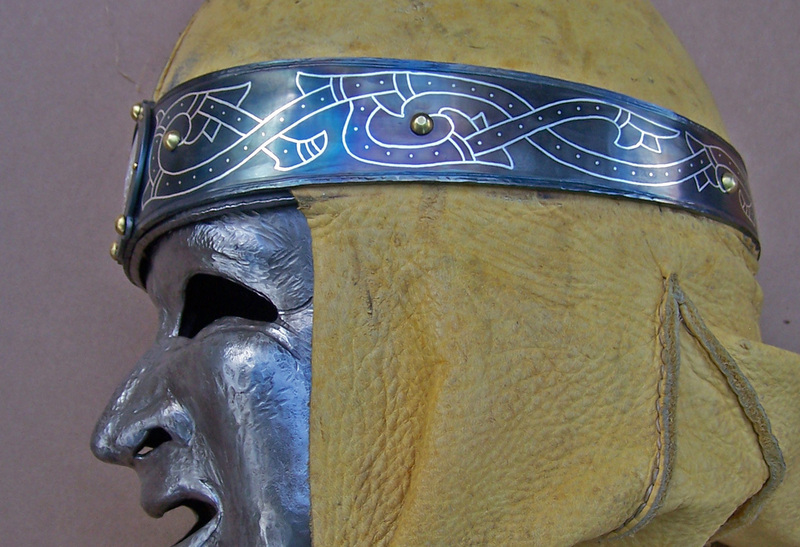 The helmet has a mask hammered to resemble the owner’s face, and a leather shroud. shaping the brow band to fit properly over the leather was extremely challenging. Pictured below are the engraved silver panels. 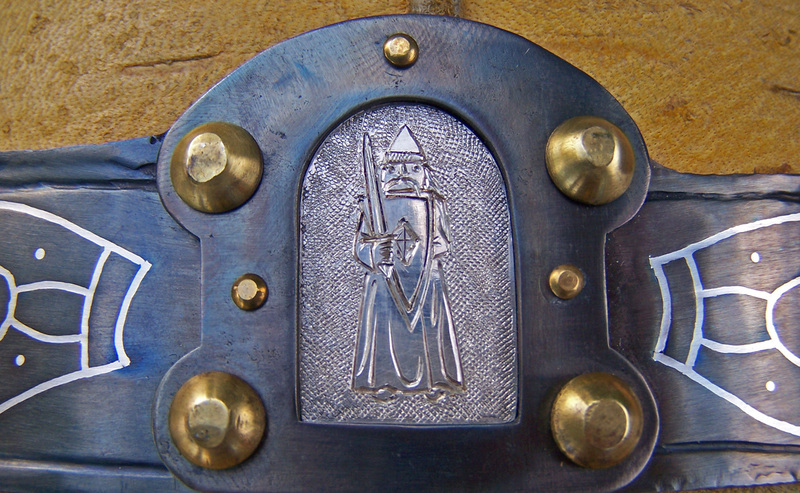 The images were adapted from carvings on a set of church doors, and one of the Isle of Lewis chess pieces. Though today we close our garments with buttons, zippers and all manner of such devices, in the past most clothing would have been pinned together. Brooches were not only a practical way of fastening garments, but were often marks of status and expressions of personal style. This brooch is the result of my frustrations with another project that was not going well. I needed something absorbing to use as a distraction. I had always wanted to make one of these disc brooches, and I had a disc left from cutting out yet another project of the right size. After a week of engraving therapy this brooch was the result. 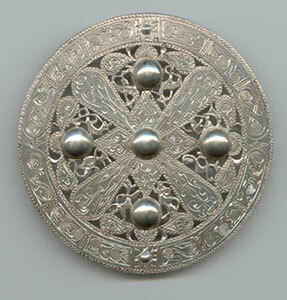 It is of a generally ecclesiastical type from Anglo Saxon England, and measures 80mm. Little brooches like these, an equal arm brooch at left, and a zoomorphic fibula at right, are somewhat under appreciated, though they are quite common in the archaeological record. They are cast of solid bronze and based on examples from East Anglian grave finds. They measure 45mm and 60mm in length, and may be ordered in sterling silver upon request. What we tend to see in books are the big elaborate brooches with lots of gold and gemstones. However what most people would have worn would be smaller, more simple and made of more modest materials. In fact we find many more simple pins such as these than the big jeweled brooches, and of those more are made of things such as bone, antler, wood and horn, than of silver or bronze. 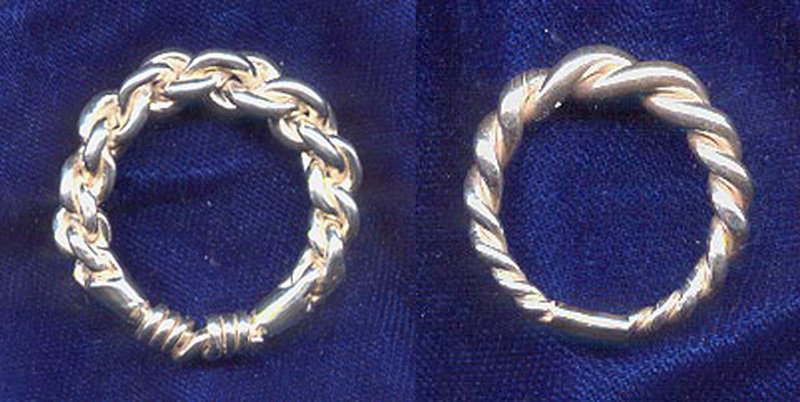 Examples of these “Omega Pins” and “Hand Pins” are found in Scotland, Ireland, The Orkneys, and the Isle of Man. I can make these in a variety of lengths, though these are 100mm to 120mm, and I can also make them in tin bronze upon request. Rings were commonly given as gifts by chieftains to honor followers and important guests. I made the ings in this section based on rings from silver hoards to provide for the continuance of that tradition. 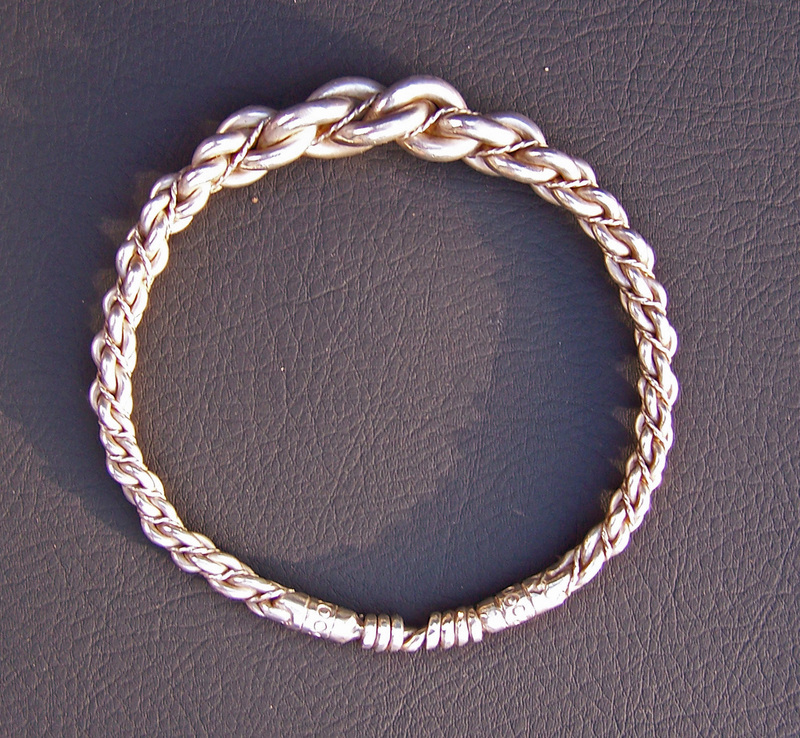 This type of ring is made by forging bars of silver or gold to an even and equal taper and then twisting them together. This is remarkably difficult to do well, especially with the four bar ring, in which each of the two bundles must be twisted to exactly the same degree before plying them together. The ends are then fused and forged out, either to then be fused together, or beaten out into wire, that is then wrapped to close the ring. 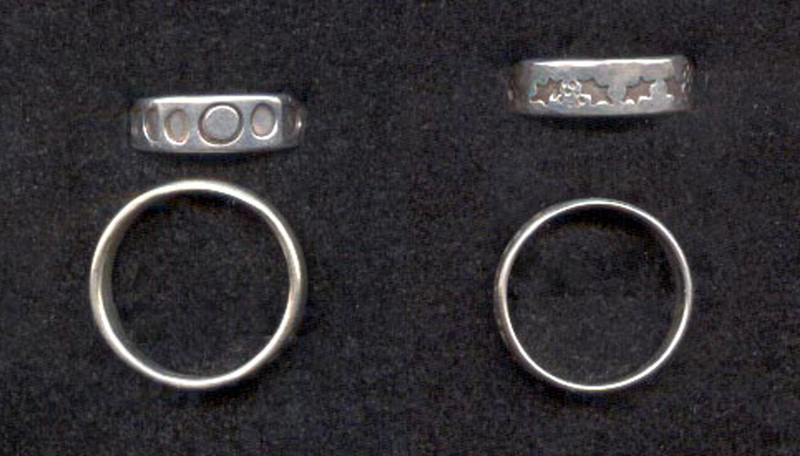 Finger rings can be made in a variety of ways. In the case of the octagonal ring at left, the ends have been fused to form a continuous piece of silver, and then forged to form its shape, and adjust the size. 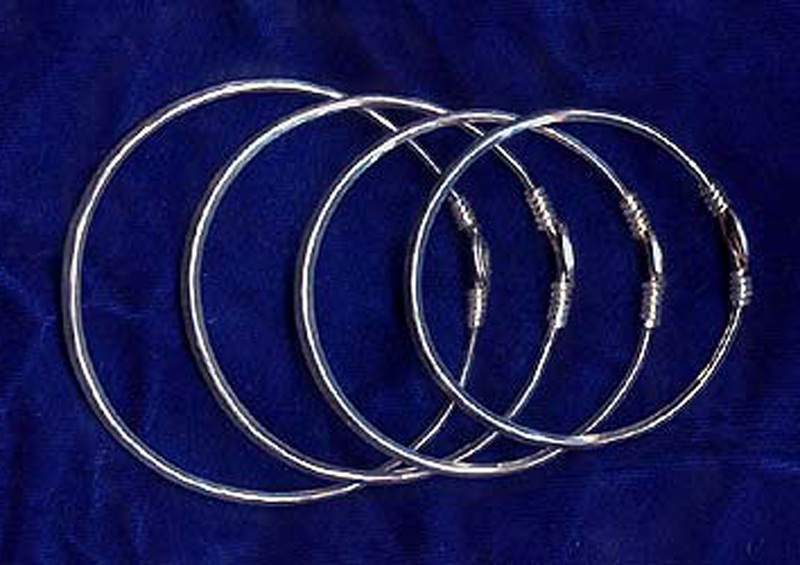 The spiral ring, at center, was made by forging the ends out into wire, and wrapping them to form a decorative closure. The size is adjusted by how far the wires are overlapped before the wrap is started. The tooled ring, at right, as been left somewhat adjustable, by simply beating the ends over one another so that they overlap smoothly. 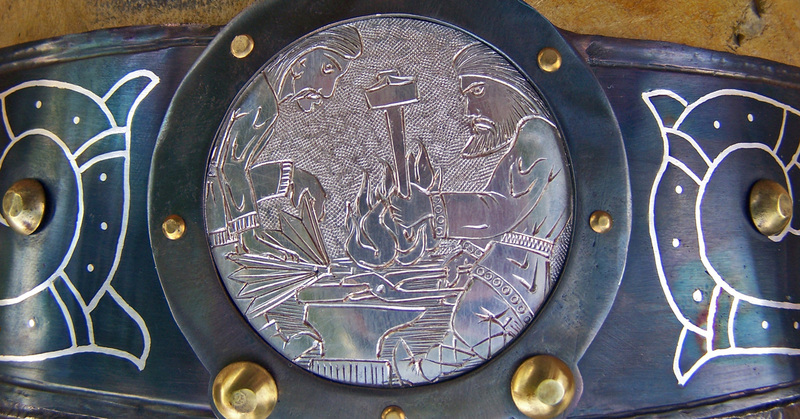 A common way of decorating metal objects in the Migration Period was to tool the surfaces by stamping repeating patterns with iron punch tools. Geometric, wave and braid patterns were popular. I make rings with these and many other patterns copied from silver hoards found in excavations. I make a variety of historically based rings set with gemstones. As faceting was uncommon in this period I tend to use cabochon cut stones like those in the above rings. I am often asked to make rings for special occasions, or with special designs tooled upon them. These moon phase and holly leaf designs are a couple of the more commonly requested motifs. In he Migration Period bracelets were often more than personal adornment, but also functioned as a portable form of wealth. In a time when coins were uncommon and more often hoarded than circulated, it was not unusual to make payment with silver worn about the arm. 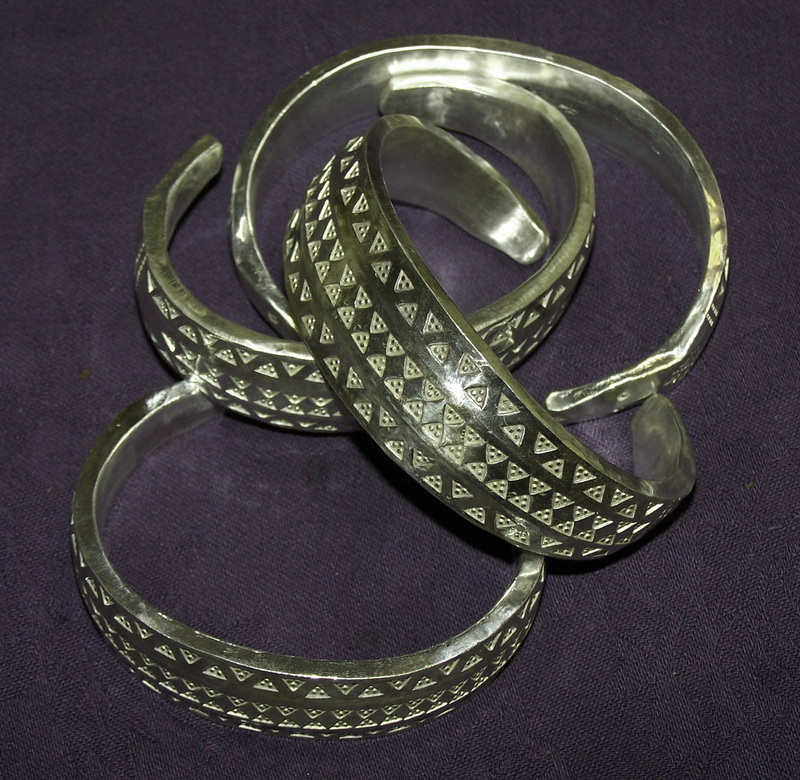 These bangles are based on an example from a dig in Trondheim, Norway. They taper, have a square cross-section, and the ends are secured by wrapping them to form a spiral closure. Though some bullion bracelets were simply bent ingots, to be weighed as needed, others were of quite specific weights. In a period when there was little distinction between monetary systems and systems of weights and measures, this makes sense. A pound was simply the weight of 240 pennies of whatever the local money happened to be. As you can imagine this could make international exchange something of a challenge. The Vikings came up with a clever aid to commerce in the Halfmark, a unit of about 104g. that is an even multiple of both English pennies and the Arabic coins used in the East. The bracelets pictured above I made on the request of an intern at the National Museum of Scotland, and based them on some from a recent find on which he had been working. For Vikings some of the most impressive displays of wealth took the form of twisted and plyed rings not only for the finger, but also for the arm and neck. These were most often silver, but for the very well off sometimes gold. This one is made of four tapered bars twisted together the same number of turns, and then twisted back against one another. I then laid in a pair of twisted flat wires as an accent, and fused the ends. When the metal had cooled I forged out the fused ends into thick wire, and joined them in a wrapped closure. This was a remarkably challenging process, but well worth it. Don Davis here. Can you do the specialy rings with a hop pattern like you stamped on the Allyshian Coronets? My lady and I are Baron and Baroness again and I am looking at them as my Barons tokens.